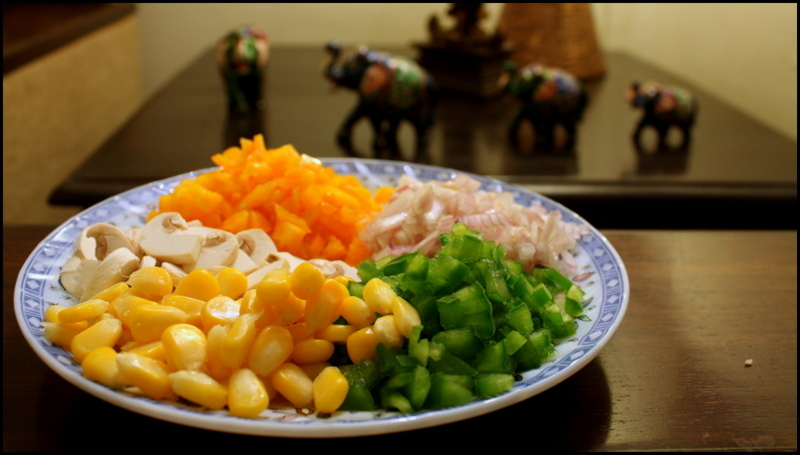 The Zesty Ensemble | The art of cooking made easy! The art of cooking made easy! Eating regular meal for a Friday night dinner is a crime and we had two of our girlfriends visiting. The plan was to slip into the cozy rugs on the sofa and watch a movie together while gorging on the comfort food! My guilty mind thought of making something relatively healthy and I thought now will be the time to cook the black bean burgers! Pressure cook the beans with water just enough to soak all the beans. Add salt to taste. Make sure that the beans are not over cooked. 10 mins in a pressure cooker is enough. In a wok, heat a little but of olive oil and add chopped onions and garlic paste. Toss in the green chilies. Wait till the onions are golden brown. 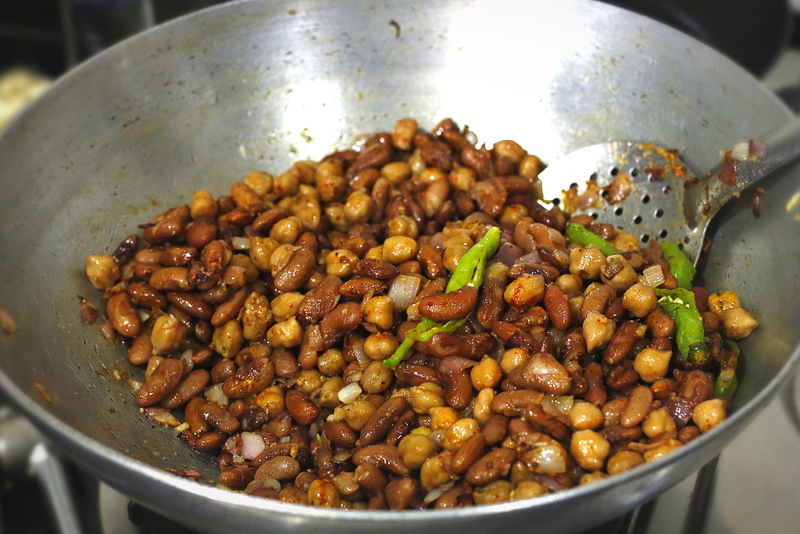 Add the cooked beans to the wok and sprinkle it with the red chilly powder. Saute for five mins until all the beans are seasoned. Grind the mixture in a grinder and make a fine paste. Add a little bit of besan for binding the paste! 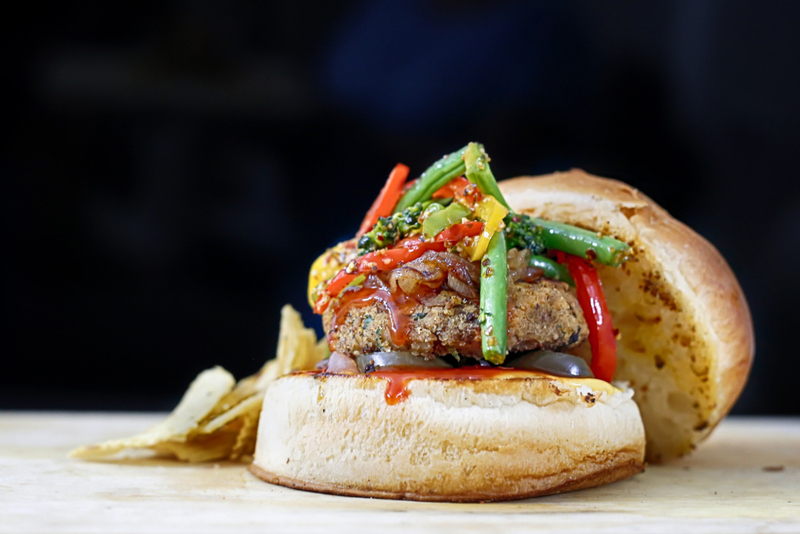 You may add extra chilly sauce if you want to make the patty feisty! Put away the mixture in the fridge for 10 mins. Make patties of the mixture and shallow fry them in olive oil in a pan for 5 mins approximately! Your patties are ready! Chop onions along the diameter to make onion rings. In a pan, add a knob of butter, you can be generous if you will. Add onions and saute for five mins. When the onions turn golden brown and a dash of sugar to help caramelize the onions. Wait till it turns brown! 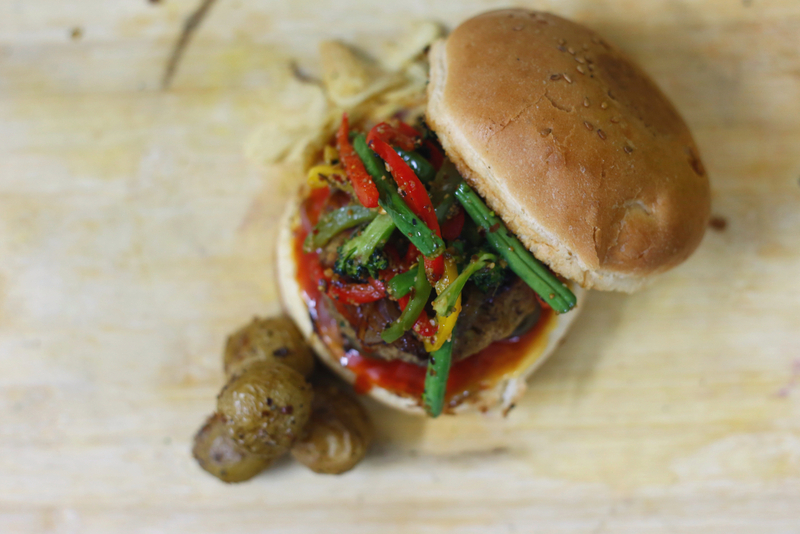 Assemble the burger with generous portions of the caramelized onions. You can also add a cheese slice on top of the patties while heating allowing the cheese to melt. These burgers taste great with the mustard mayo sauce and some jalapenos. Since we seem to be surrounded by so many awesome culinary enthusiasts we decided to introduce another one of our guest chefs- Sunita aka tai atya. Tai atya shares our passion for food but she hardly gets the chance to experiment at home. So whenever we visit her or she visits us, that’s the time she loves to cook her heart out. Visits to her place are a true gastronomical treat. 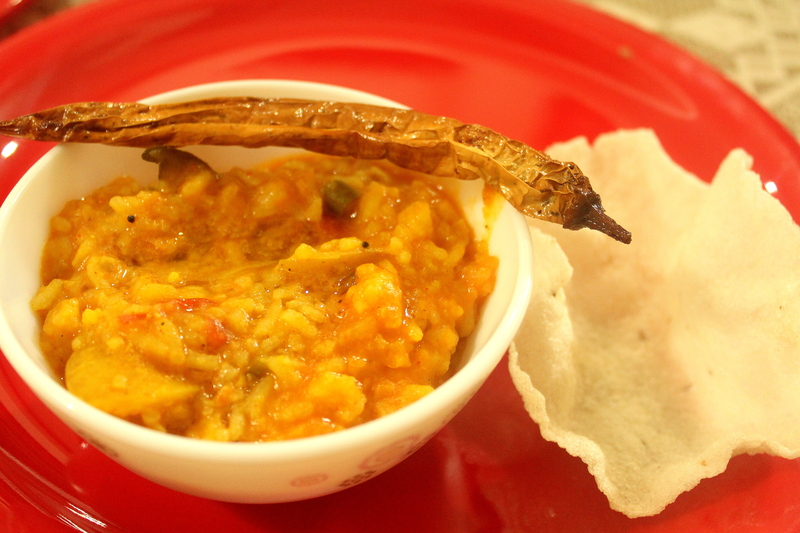 Today, we present to you Tai atya’s authentic south indian bhisibaelianna. Summer vacations are all about spending time at our aunt’s place in Hubli, a humble city in Karnataka. When we were young we loved these visits because we got to enjoy pure south indian food cooked in our atya’s kitchen. As we grew up we developed this love for the amazing food and the zest to cooking it on our own. 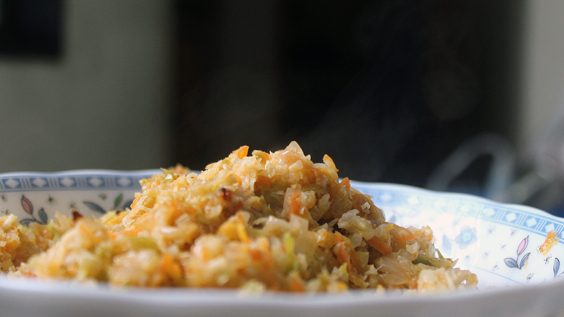 So on our recent visit to Hubli, we decided to learn how to cook the oh-so-awesome “Bhisibaelianna” which literally means piping “hot lentil rice”. 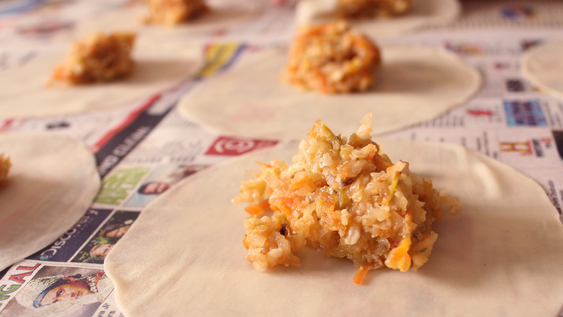 A typical south indian delicacy that is both appetizing and appeasing. The recipe seems complex but is actually pretty easy to make at home. and because of its spicy yet subtle taste it is the perfect food for a laid back dinner. Roast all the masala ingredients separately on a low flame. Blend them together to form an aromatic powder. Take one cup rice and add 3 cups of water. We want the rice to be sticky and a bit like porridge. Add 2 cups of water to toor dal and add all the vegetables along with salt, tumeric and asafoetida. If you are using the regular cooker then you can cook the rice and toor daal together. Saving lots of time. Once the rice is cooked and cooled, break the rice so that there are no lumps. Mix it well and ensure there are no visible lumps. Now, heat the oil add mustard seeds, asafoetida, tumeric and lots of curry leaves. Add the ground masala 3 tbsp. Add a bit of salt to taste. 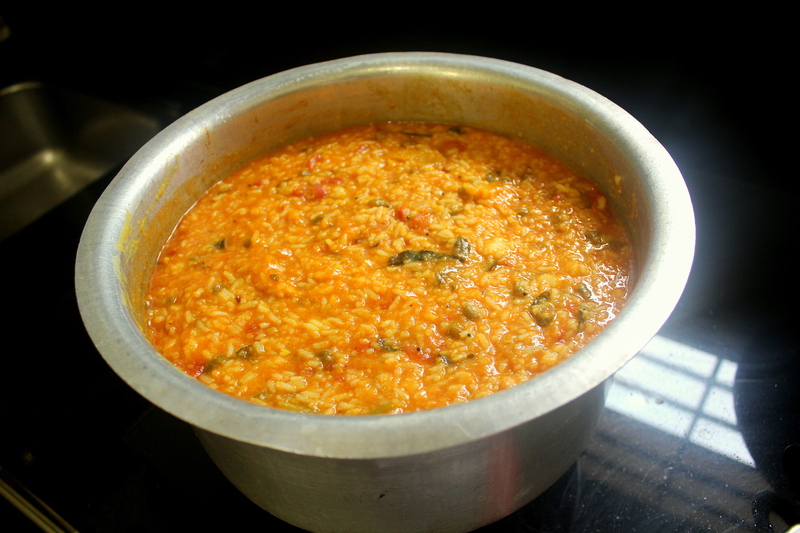 Once the tomato is cooked, add the daal and rice mixture. Add a bit of water to get the consistency of the porridge. Add ghee (4.5-5 tbsp) to make it glisten. Let it simmer for 10-15 mins. Serve hot with nice papad and fried/roasted chilly! Here’s our next guest chef – Tanvi. A know-it-all gal, she’s an expert on almost everything. Geography, conspiracy theories, good and crappy music, books, travelling and the list continues. However, her love for food and knowledge of the same knows no bound! We present you her recipes of home-made dips! Chips and dips are guaranteed party pleasers. Whether it is a sleepover, or a movie marathon, or simply chilling out with your buddies, everybody LOVES chips and dips! A big bag of chips or a big bowl of fries are gone in no time. To add a lil bit of change, we decided to try out some dips to go with the deep fried awesomeness. You can also dip veggies like carrots and cucumbers or a celery stick in these dips, if you want to serve healthy finger food. These dips are pretty easy to make. One of them is a simple garlic mayonnaise and the other is a tangy mayonnaise dip. Being vegetarians, we had to look out for a no-egg recipe, but one that would still ensure a creamy, rich dip at the end. In a deep container, add the cream, garlic cloves, lemon juice, pepper and salt. Use a hand blender to mix all these ingredients. Add the oil, one little spoon at a time while blending the mayonnaise. Do not add the oil too much at a time; it will not thicken the mixture enough. Whip the mixture till the oil and the cream are blended completely. Serve with your favourite finger food! Mix the mayonnaise, ketchup, chilli sauce / Tabasco in a bowl. Add the onion and cucumber. You can add more ketchup if you want an added tang. 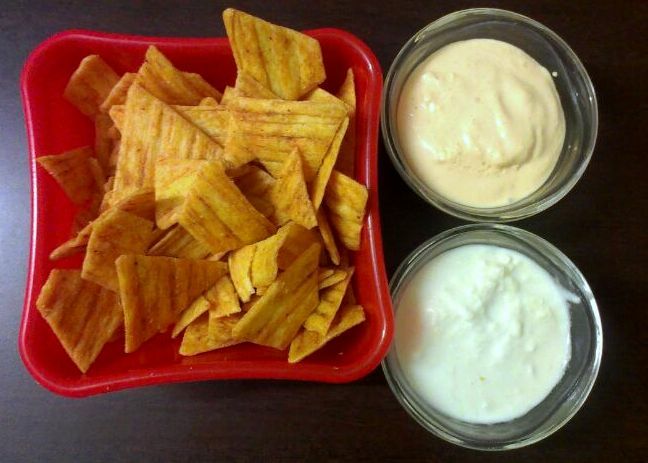 Chill the dip for some time, and serve with hot fries, or super crunchy chips! Salads have always reminded me of Turpin High School. The cafeteria had lovely grilled cheese sandwiches, cinnamon rolls and an amazing salad bar. Being an exchange student and vegetarian, I hooked on those options real quickly. 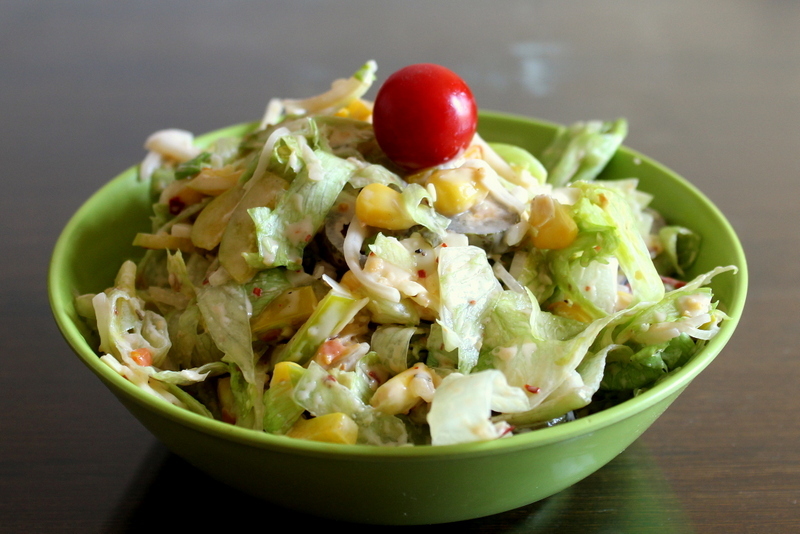 Initially salads only meant cucumber, tomatoes and capsicum. But slowly I got acquainted with lettuce, olives, jalapeños, cheddar cheese, ranch dressing and crackers. Not the healthiest of the salads, but sure made lovely lunches and amazing conversations to remember! When I got back, we started to adopt those recipes and now, its become a part of our varied food palette. Slowly we moved from cream based dressings to healthier versions. But, once in a while, we do tip off to the other side just as a treat! 1. Boil the corn and let it cool down. 2. 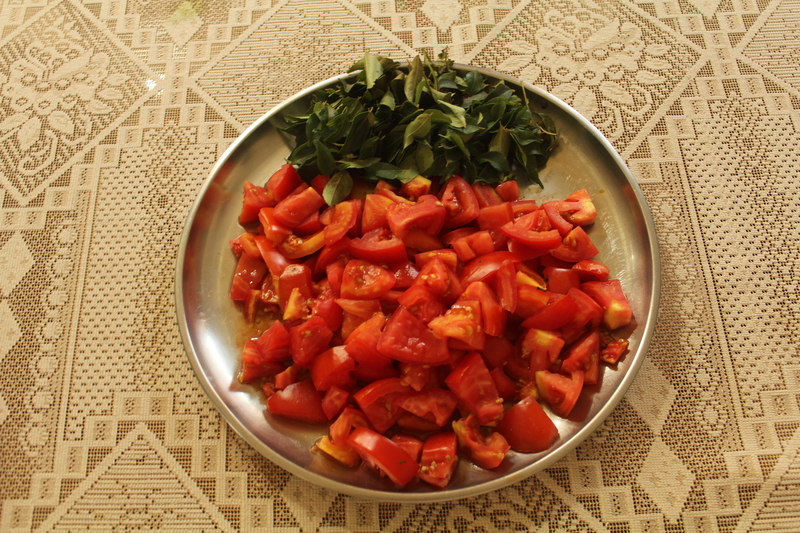 Chop and halve the cherry tomatoes. Slice the olives and jalapeños. 3. 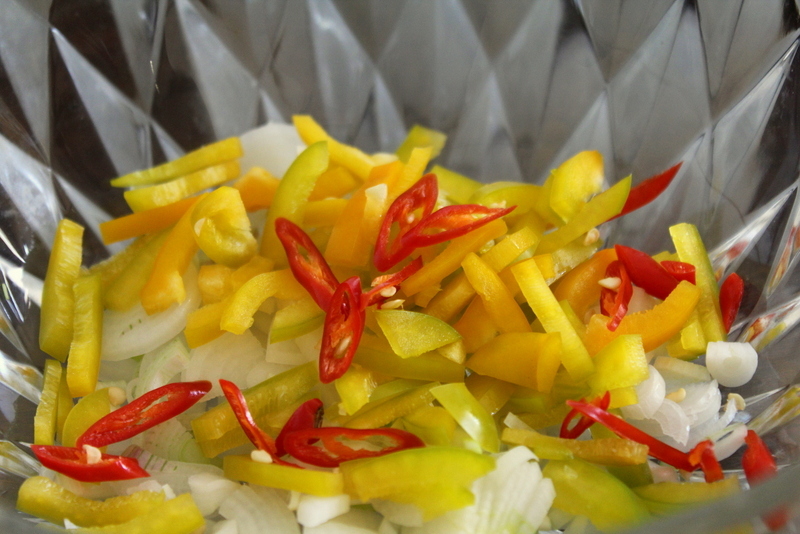 Chop capsicum, onions, and bell peppers (julienne). Chop the red chillies finely. 4. Coarsely chop the lettuce. 5. Combine all the veggies. Sprinkle the red chillies over. For a zing, add dried garlic powder. 😉 Sprinkle the cheddar cheese. 6. For the dressing, mix the mayonnaise ketchup and a bit of salt. 7. Spread the dressing over the salad and toss it to mix well. And voilà, there’s your salad treat! Sunday afternoons usually tend to be lazy. Having worked all week long and most of Sunday morning; Sunday afternoons bring in a lull in the house. It also means nobody is in a mood to cook. 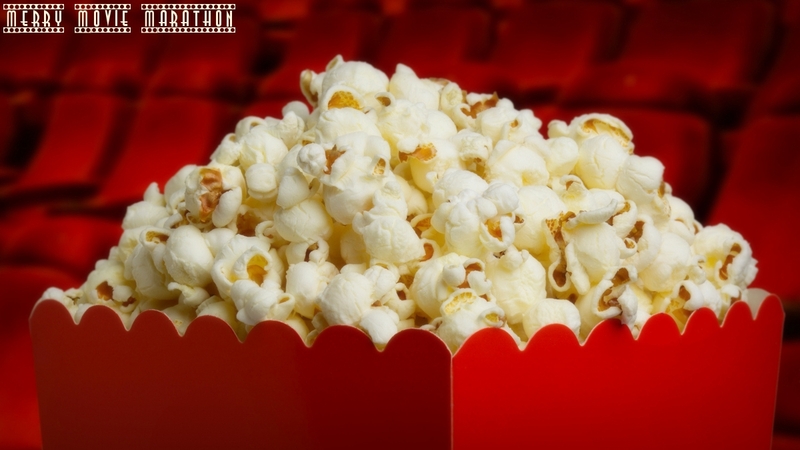 Everyone is looking forward to having a movie marathon with scrumptious food to keep us company. 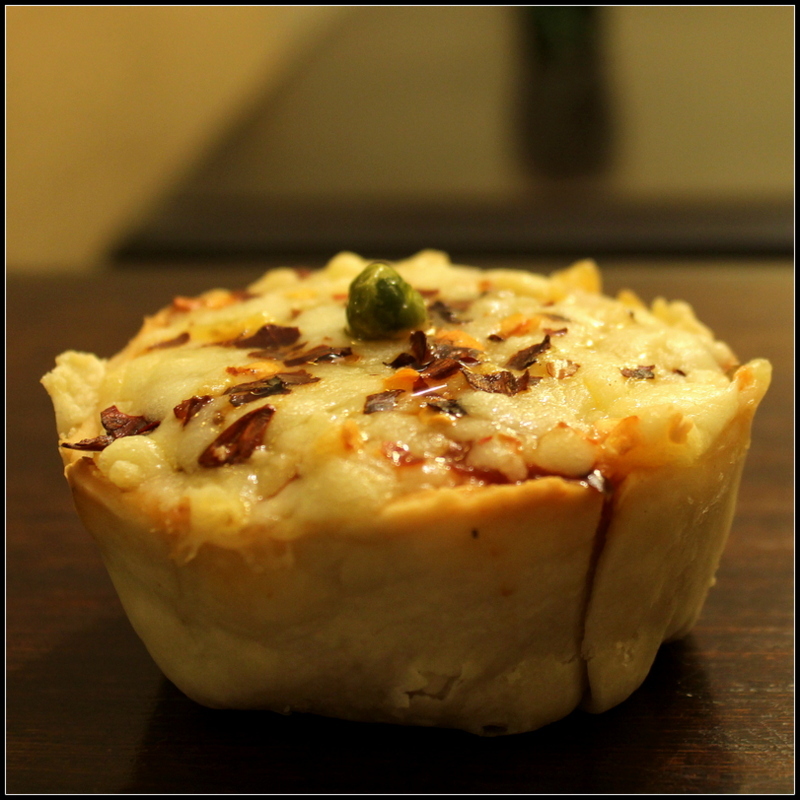 Home-cooked vegetable pies are the perfect item for the occasion. Easy to cook, hassle-free dish yet tasty, flavoursome and filling; its the perfect recipe for a Sunday lunch.No “jhanjat” of elaborate cooking and extensive cleaning afterwords.Just assemble them and put them in the oven and they’re ready in no time. 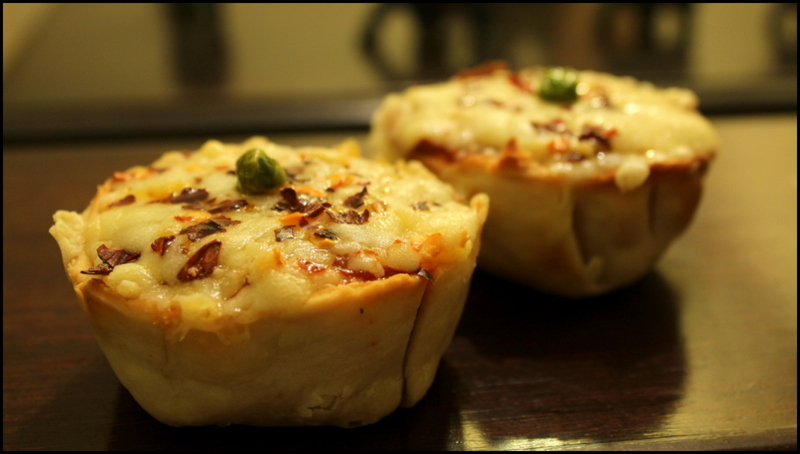 Filled with vegetables, tangy tomato sauce, crunchy pastry base and loaded with stringy cheese; these pies are the very definition of a laid back Sunday lunch!! Mix the flour, butter and salt with your finger tips. Do not over knead it, otherwise it shall lose the crumbly nature. Add ice-cold water to make the dough. The dough will be a little crumbly. Roll out the dough to about 2mm thickness. 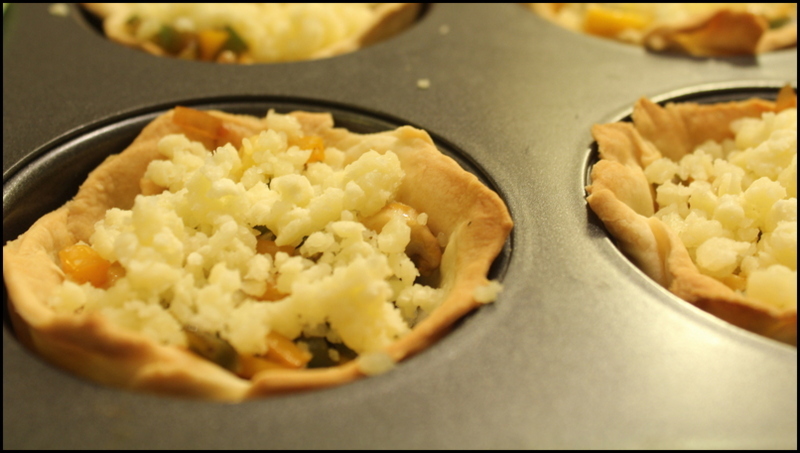 Arrange the dough in ramekins to make small sized pies. Large pie pans can also be used. Bake in pre-heated oven at 200C for 10 mins. Heat the oil in a pan. Add onions and garlic. Sauté until the onions change their color. Add the seasoning – black pepper and oregano. Seasoning can vary from person to person. Let it simmer for a while. Keep aside. Note: If purée is not available, you can use ripe tomatoes. Blanch the tomatoes, de-seed them and blitz it in a mixer to create a pulp. Add the chopped vegetables until half cooked. Add the seasoning and let it rest. Spread the tomato sauce over the pre-baked pastry. Arrange the vegetable topping over the sauce. 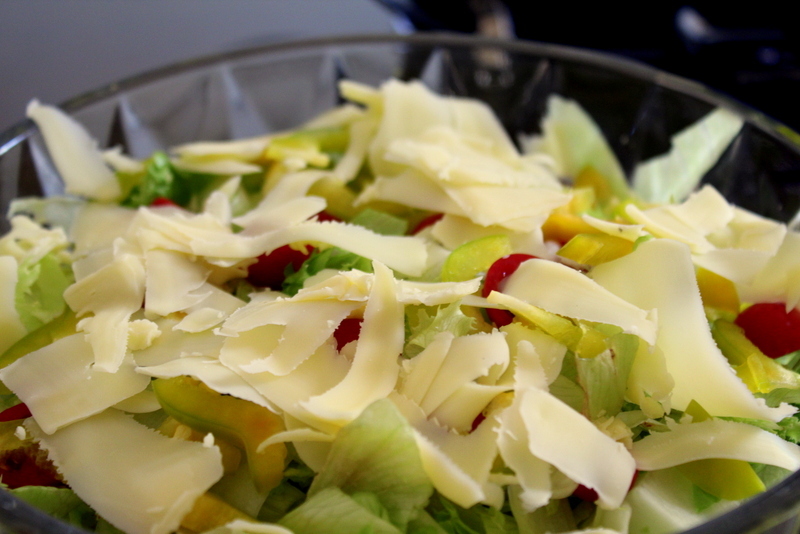 Add the grated cheese on the top. Bake in a pre-heated oven at 200C for 5-8 mins or until the cheese bubbles. Freshly baked pie over a movie is surely an afternoon delight!! Introducing our first guest chef – Ria. Ria is a young 7th grader. From dancing to gymnastics, singing to science projects.. She’s got everything under her belt. How was baking going to be left behind? 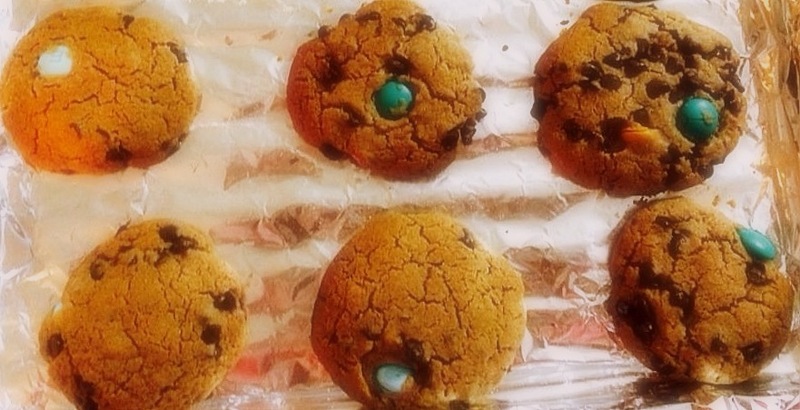 A budding baker, we present to you her chocolate chip cookie recipe. Colorful lights on the tree, a chilly breeze in the air, a blanket of snow on the ground…you guessed it, it’s Christmas time! Everyone’s in a jolly mood, spending time with family and friends, giving to the ones in need, and of course.. eating yummy food! One of the popular holiday treats are chocolate chip cookies, a very simple yet delicious recipe to eat. Although Christmas is now over, the sweet aroma of these cookies is still lingering around our house and is sure to make your new year delightful! Put the softened butter, eggs, water, and vanilla extract into the bowl and mix. Then, add the sugar, flour, baking soda, and salt and mix until it is thick. Lastly, add the chocolate chips. Make the cookies about 2 inches wide, and drop onto greased pans. The hot cookies with warm milk is all one needs for a wonderful holiday season! Our first encounter with the steamed dumplings or “Momos” as they call it here in India was when we went to Delhi for the first time in 1999. We loved them instantly! Momos in North India are mostly stuffed with chicken filling and served with hot sauce that burns your lips but not your tummy! They were introduced to the Indian street food by the Tibetans. A lot of these vendors in most parts of North India are still Tibetans. Its mostly cold in the North and nothing beats the fun of having something really hot for cold winter nights! We tried steamed dumplings here in Pune in a very pricy restaurant however it was no match to whatever we had tried on the streets of Delhi. Then one day we accidentally stumbled upon our very own “Momowala” in Pune! He serves momos directly out of the steamer, they are piping hot served with super spicy, chilly and tomato sauce… it can make you sweat even if its cold out there. 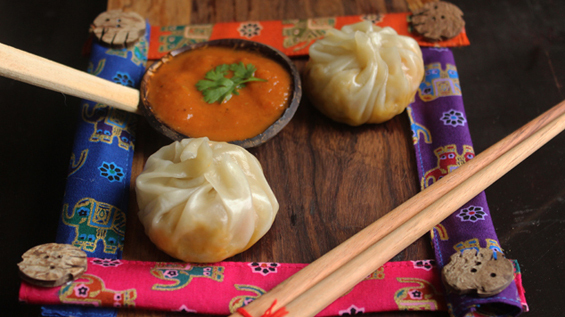 Making momos is really simple and easy, just follow the recipe and enjoy the steaming hot momos with spicy sauce! 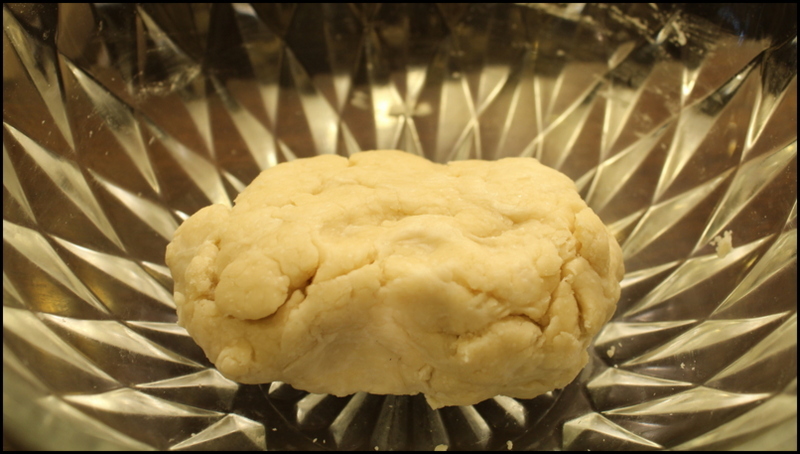 Mix flour, salt and oil and add water to make a smooth dough. Keep aside covered. 1. Grate all the vegetables except onion, chop them finely. Heat oil in a wok. Once the oil is heated, add onion and garlic together. When the onion turns pink, add rest of the vegetables. 2. After two minutes, add the green chilly sauce, salt and a pinch of sugar. Let it simmer for another 5-7 minutes. 3. 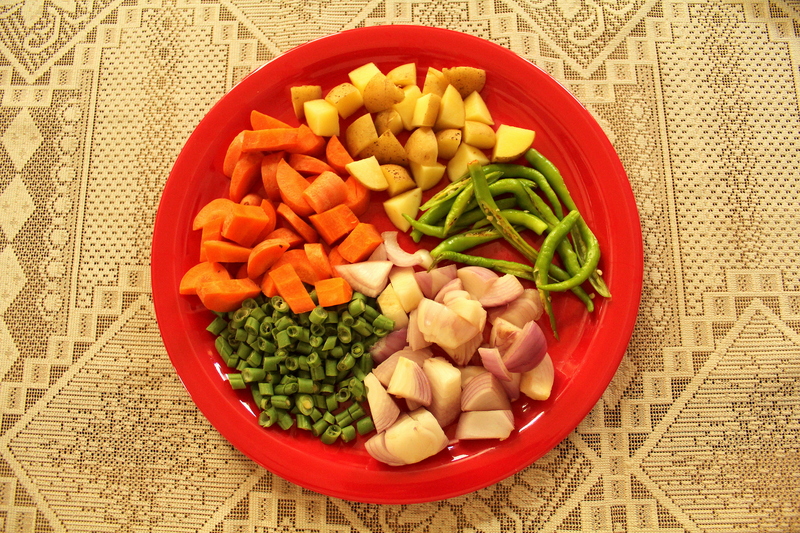 Make sure that the vegetables are not over cooked to avoid sogginess or wet filling. 1. Roll out the dough in a circle. Place the filling the in the center. 3. 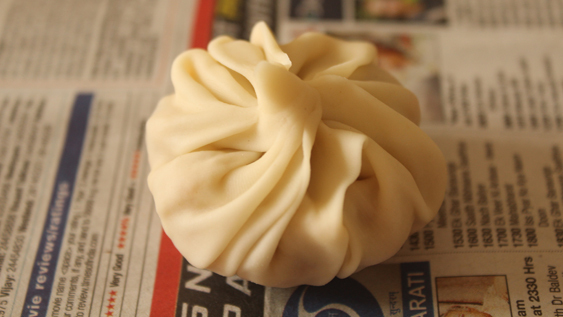 While the momos are being wrapped, heat some water in the steamer. 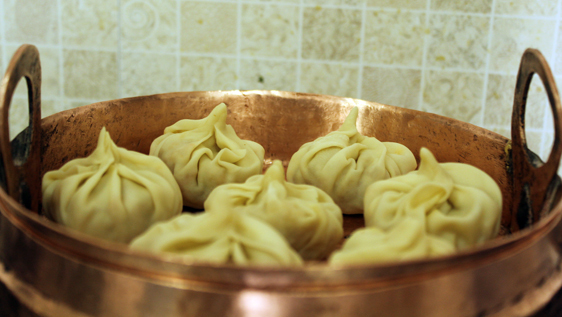 Once the water is boiling, place the momos in it. And cook it for 10 mins. 1. Blanch the tomatoes and skin them once they are done. 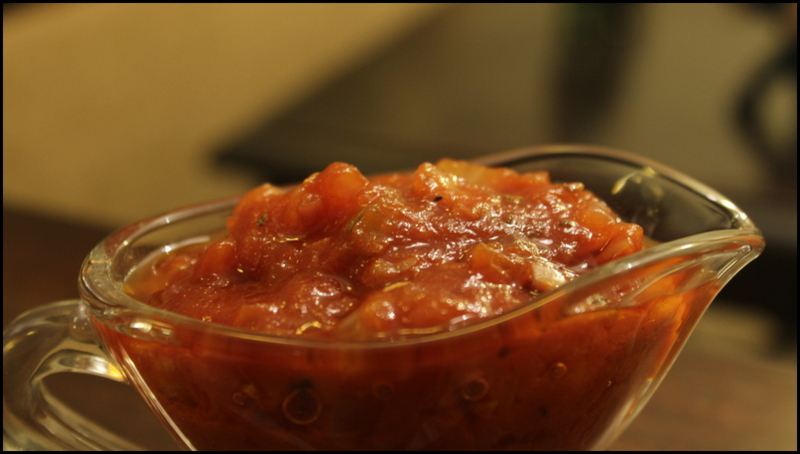 Grind the tomatoes in a mixer to a smooth paste without adding water. 2. Heat oil in a wok and add the chopped onions. Finely chop the garlic and add them to the wok. Add finely chopped green chilly. Once done, add the paste in the wok. 3. Add the chilly powder and salt to the paste. If you have a sweet tooth, you can add the a little sugar. Or ketchup to get the perfect tang. 4. Let it simmer for a while. 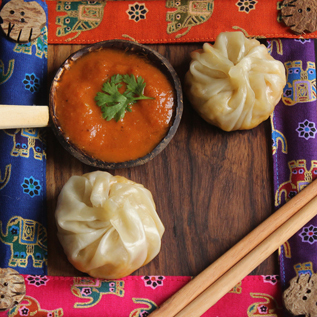 Once the sauce is ready, serve the hot tomato garlic sauce with the pipping hot momos.